These saw some domestic service in the Spanish Civil War, and were offered for sale to the US and British in WWII, but were never bought due to what you will see below is quite needless complexity. The -35 series SMGs are of conventional layout and construction for first generation SMGs. While the bolt and channel is circular in section, the receiver is not a simple tube, but a complex machining, which includes a locking recess, so is also heavy enough to support firing stresses. The -35 series SMGs have a full wooden stock, with a straight comb and a medium sized pistol grip. While the comb is unlike anything issued, probably to help keep the head in place under repeated recoil, the grip is very similar to the contemporary "Spanish" Mauser rifles. A sling swivel is attached to the left side of the buttstock. The trigger is conventionally placed and configured for rifles of the era, with a deeply hooked trigger, surrounded by a fairly small trigger guard mounted to a plate inletted into the bottom of the stock. The trigger guard plate has holes through which screws are placed. Without further disassembly it is unclear if these only secure the trigger guard plate, the entire fire control system, or are action screws which hold the receiver to the bottom metal also.. There is no evidence a folding stock, or that any breakdown (quick-disassemble) or cut-down versions were made of these guns for use by vehicle crews or parachute troops. The charging handle is non-reciprocal, and is integrally machined with a sliding plate on the right of the receiver, which reduces the amount the inner workings are exposed to the elements, but is another tightly-fit piece that must be kept clean. It can also interfere with re-assembly and must be positioned properly to insert the bolt assembly. Magazines are straight boxes, with single position feed. Capacities of 10, 30, and 40 rounds are reported. Witness slots provide an easy view of the current state of the magazine. The magazine fits into a chute at the bottom of the receiver, with large holes in the side. These appear to be lightening holes, but are likely provided so the witness slots can be viewed while the magazine is inserted. The magazine release is a lever at the lower rear of the magazine well. Press forward to release the magazine which will drop free, although the lever is best activated by grasping the magazine at the same time and positively removing it by hand. 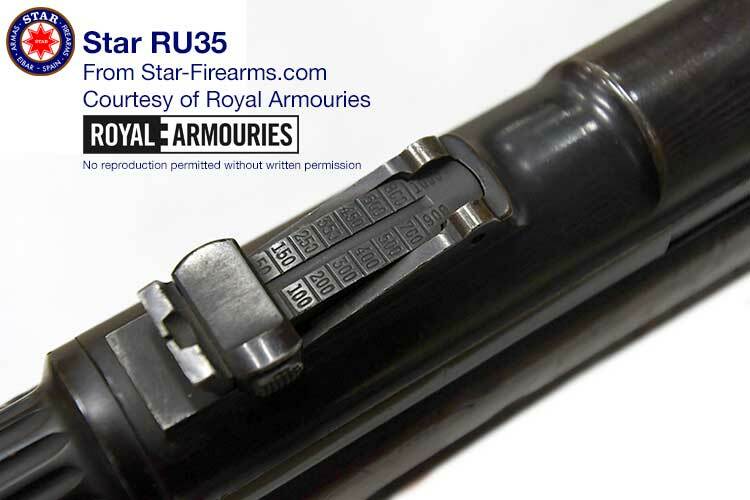 I was able to inspect two RU 35 guns (but no other versions) at the Royal Armories in Leeds, and found some significant changes over time, which appear to be for reduction of costs of production over time. However, many other changes were not made, and the guns continue to be very complex and expensive to make. This lack of meeting demand, and the inherent complexity of the gun's design, presumably led to fairly few being made, and their lack of success on the export market in the run-up to the Second World War when guns were otherwise in high demand. The barrel on all guns has a long section of tapered radial fins for cooling. However, only the older model has a long heat shield to protect the firer from the barrel heat. The front sight on the older model has protective ears, but these have been removed from the later model. The older gun is fitted with a complex multi-slot muzzle brake, not unlike a Cutts Compensator. While probably effective, on such a large gun, with a low rate of fire, it is probably not necessary. The newer gun has a plain muzzle with no flash hider or compensator. A bayonet lug is also provided on the older model, though it is not clear which bayonet fits the gun, and the distance from muzzle to bayonet lug is very short. Basic disassembly is fairly easy, with a simple spin-off rear cap. The cap is deeply grooved, and has a mechanic lock lever that must be depressed. Both these are needless features, adding a lot of machining time, even for the period. Simple knurling and a detent would certainly suffice. The recoil spring and bolt assembly may then be removed, and the receiver and barrel cleaned. To access the fire control parts required a screwdriver, and is clearly not a job intended for troops in the field. This is where the complexity really starts. The -35 series SMGs are not straight blowback, but have a delay mechanism. The bolt is a stepped assembly, reminiscent of the design of many a self-loading .22 rifle. A long, narrow bolt about the diameter of the cartridge case protrudes from the front, with an ejector and extractor pinned to, and protruding from the sides. The much thicker rear contains multiple components, and pretty much falls apart when inverted once removed from the gun. Assembly is fairly simple and the parts are not symmetrical so it cannot be assembled incorrectly. The rear of the bolt is a linear hammer, which is driven by the recoil spring. Between the two are a locking piece and a delay arm. When the trigger is pulled, a sear latch retracts into the receiver, allowing the bolt to fly forward, and strip a cartridge from the magazine. Once the bolt head is in battery, the linear hammer continues forward, striking the firing pin and firing the cartridge, but also driving the delay arms into the "locked" position. The force of firing pushes back on the forward bolt body. It cannot immediately move, as a block is engaged into a cutout in the upper receiver. This block has an angled rear surface, which corresponds to an angled rear surface on the receiver. Especially as the spring force is pressing the block into place, this provides a mechanical disadvantage. The chamber pressure slowly releases this mechanism, and when the block has dropped sufficiently, the entire bolt assembly is free to move to the rear, compressing the recoil spring, and is ready for the next shot cycle. The angle of the locking block and cutout will change the delay, and presumably is the method used to control the rate of fire. The angle on the RU 35 inspected at the Royal Armories was very steep, so 300 shots per minute seems plausible. However, delay mechanisms in SMGs are rare and it is not clear why the Star engineers found it necessary, with such a large gun. Bolt mass, and travel, should have been enough to compensate for the force of firing pistol ammunition. During my inspection of the RU 35 at the Royal Armories, we could not get time with their armorer, so could not disassemble the gun fully or see the lockwork itself. The left side of the gun has two levers which each rotate over about 90°. The labels vary between the two variants but are always safe/fire at the rear, and semi-auto/full-auto for the forward lever. When the forward lever is moved, the gun makes a strangely bouncy mechanical noise unlike a normal gun lockwork click. It is not clear what all the lockwork is doing, as the only part we can see is the sear. It does not get reset by bolt travel, so can be pulled repeatedly. 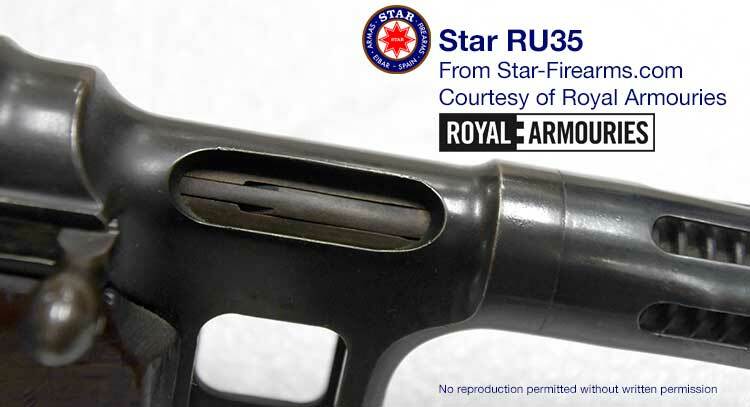 Whether set to full- or semi-auto, the sear retracts momentarily, then re-emerges. While it may seem on the face of it that this this controls the rate of fire, it would be pretty much unprecedented for firearms, as there are no other levers or sensors which would more conventionally allow it to operate. It has long been reported that the Si35 fired at semi auto or either of the rates, but only by setting an amazingly complex configuration of two multi-position switches. However, this seems extremely unlikely. All the guns in the series have two levers, so is is vanishingly unlikely that this part is true. Additionally, since delay timing appears to be controlled by the locking blocks, it seems improbable that any other mechanism for delay would be added into the gun, to allow two rates of fire. I do hope to sometime learn more, or be able to inspect or fire an Si 35 and find more about this. If anyone has leads, do contact me. The sights are very typical for SMGs of this era, and are very similar to the contemporary Mausers, with an unprotected tangent rear sight able to be adjusted to a very optimistic 1000 m range. While SMGs are perfectly usable to 200-300 m, able to hit small groups of people with a burst, and single targets with careful aimed shots, 1000 m is nearly impossible due to time of flight, wind drift, and crossing the sound barrier. The bullet will also have lost so much speed that it would be very ineffective on target as well. The front sight varies on the two versions I inspected, as described above. The design of the 35 series pre-dates the Civil War, with smaller numbers produced for the Army, and about 100 issued to the Guardia. Export sales were planned, with a version called the "Atlantic" in 9 mm Luger/Parabellum, and 7.65x20 Longue, at least. With the start of the war, the RU 35 and SI 35 were manufactured—in 9 mm Largo of course—for the Republicans, until the capture of Eibar by the Nationalists when production switched to supplying that side. There are no solid numbers, but at most a few thousand were produced in total. The markings on the guns I observed in the Royal Armories indicate they are likely in 9 mm Parabellum, with both marked "9 m/m." Information for at least the older of the two guns seems to indicate that it was obtained by the UK Ministry of Defense in 1934, which makes it before the Spanish Civil War, so likely a very early production gun, offered for export and simply never returned.